The MCF series of flow meters for compressed air/nitrogen employs our proprietary Micro Flow thermal rate sensor as the sensing element. 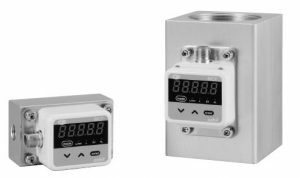 Despite their low price, these meters are capable of measuring mass flow at 3% FS in a measurement range of 50:1, and are equipped with a reverse flow detection function, a normal/reverse flow detection function, and more. They can measure up to twice the flow range with an accuracy of 10% reading.